WASHINGTON — Senator Elizabeth Warren ended months of neutrality in the Democratic primary Thursday and endorsed Hillary Clinton, urging supporters of Bernie Sanders to get behind the presumptive nominee and help defeat Donald Trump. Warren’s endorsement followed President Obama’s by just a few hours, but it could be equally as important in rallying a liberal base that is suspicious of Clinton because of her warm relations with Wall Street and a track record of supporting international free trade deals. The senator from Mass. delivered the remarks in Washington on Thursday. Sanders frequently calls on Clinton to release them. Warren, a champion of the left who passed up a presidential bid of her own, despite the urging of legions of followers, is uniquely positioned to serve as a bridge between the establishment candidacy of Clinton and Sanders supporters, who are being forced to come to terms with the Vermont senator’s loss. Democrats view the freshman Massachusetts senator as a path of sorts to party unity, which helps explain an upsurge in buzz about Warren as a potential vice presidential pick. Senators and top staff say talking up Warren for vice president is a way to show Sanders and his millions of followers that the party establishment heard them loud and clear. Warren and Clinton haven’t always been close — Warren called out Clinton in her book “The Two Income Trap” for switching her vote on legislation to overhaul bankruptcy laws when Clinton was in the Senate. “Hillary Clinton could not afford such a principled position. Campaigns cost money, and that money wasn’t coming from families in financial trouble,” Warren wrote in a biting critique of the episode in which Clinton sided with the financial services sector and helped pass an industry-friendly overhaul of the bankruptcy laws. In an interview Thursday evening with MSNBC, Warren said she’s not currently being vetted to be on the presidential ticket, but didn’t clearly say whether staff-level discussions about her taking that role were going on. “I know there’s been a lot of speculation on this. The truth is I love the work that I do,” Warren said. The day represented a shift in attention paid to progressive leaders, as Sanders’ star was fading and Warren roared back into the spotlight. A speech she delivered in Washington Thursday evening was broadcast live on cable channels, while Sanders’ rally in the same city was just shown in a corner of the screen. Democratic colleagues enthused that Warren would be the right vice presidential pick to prove that Clinton’s moves leftward during the primary were not temporary. “I have such admiration for Hillary Clinton and Elizabeth Warren, it’s hard for me to convey that to you,” said the Senate’s minority leader, Harry Reid, adding that he has “no problem” with two women being on the ticket. Minutes after word spread Thursday that Obama had endorsed Clinton, Reid invited Sanders for a very public display of unity. Waves of reporters were ushered in and out of a small room to witness the two men awkwardly sitting next to each other. No questions were allowed. At first, Sanders frowned, but he cracked a smile after Reid murmured words not audible over the camera clicks. Sanders vowed to remain in the race through the District of Columbia primary voting on Tuesday. But the mood among Democrats was of moving on — quickly. Even the one Democratic senator who had backed Sanders over Clinton during the primary has already switched to Clinton. “I think that is a spectacular, spectacular idea,” Jeff Merkley of Oregon said in a phone interview when asked about the Warren vice presidential buzz. He stressed that it is important for Clinton and the Democratic Party to embrace some of Sanders’ ideas, whether that be part of Clinton’s policy stances or changes to the Democratic National Committee platform or primary process, such as the elimination of so-called superdelegates. He was hardly a lone voice of love for a Warren ticket. “She should be on the list” of vice presidential candidates, said California Senator Barbara Boxer, an ardent Clinton supporter. “Awesome,” said Senator Kirsten Gillibrand of New York. “An electric, magical ticket,” said Senator Ed Markey of Massachusetts. Of course there are many others in contention for the vice presidential slot, and one top Democratic aide said the enthusiasm for Warren should be read as the establishment Democrats acknowledging the power of the liberal branch of the party that Sanders has been representing nationwide. Still, while Sanders spent the last 24 hours planning and executing carefully timed and stage-managed photo ops in Washington’s places of power, Warren sparred in the trenches with Republicans. She took on the Senate majority leader, Mitch McConnell, on Wednesday in a feisty floor debate over the Republicans blocking a confirmation hearing for the vacancy on the Supreme Court. It’s a topic outside her traditional portfolio of economic issues, evidence that she’s spreading her wings for broader fights on behalf of Democrats. 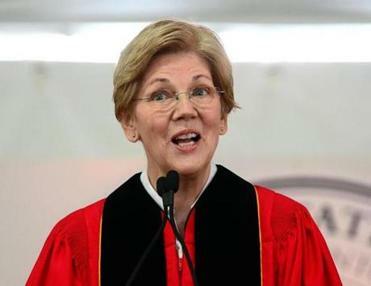 On Thursday, before Warren endorsed Clinton on MSNBC, she delivered a scathing speech at the American Constitution Society’s annual convention that sought to tie Republican leaders in Congress to Trump. She referred to Trump by name 74 times, according to her prepared remarks. Warren’s willingness to take on high-profile issues is also being noticed by her potential rivals.